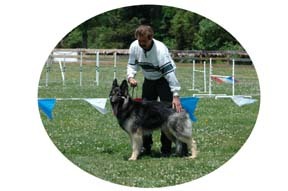 Noble Acres Kennels can be found in the beautiful state of Virginia. We're about midway between Culpeper and Fredericksburg VA, in a lovely little town called Locust Grove. We fell in love with the Shiloh's wonderful temperament and regal beauty years ago and just knew we had to have these magnificent animals as part of our family. After getting to know and love our first Shiloh, Bello, we felt we'd like to be a part of the family of devoted breeders who are carrying on the magnificence of this breed. Our Shilohs will always be our family members and live with us as such. We do not kennel our dogs. 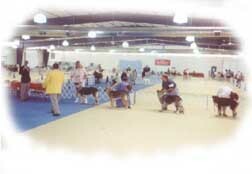 Our puppies will be raised in our home with all of the people, animals, sights and sounds that go with it. 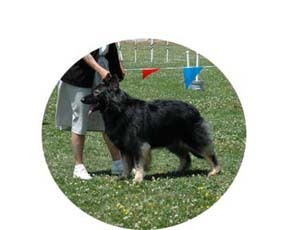 Our commitment comes from our hearts and is carried on with a passion to continue to learn as much as we can to carry on the magnificence of this incredible breed of dog. We show our Shilohs ourselves at many regional shows. We can often be seen at the larger shows in other parts of the country as well. These shows turn out to be reunions in which we meet many friends, old and new. We share our home with eight Shilohs. 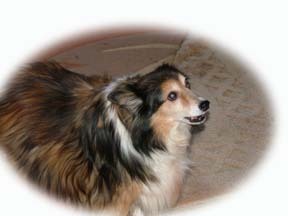 We recently lost our 17 year old Sheltie named Mousie. Our dogs all got along with Mousie even though she was old and crabby and had been known to "bully" the bigger dogs at times. We'll never forget you Mousie. Mom will always love you.